Rated 3 out of 5 by bonnadonna from Vampire Secrets Good game, something different. I like to try games from all different levels. This game has good puzzles. Rated 2 out of 5 by game_happy from VAMPIRE COMPELLED ME TO BUY THIS GAME Review based on about 2 to 3 hours gameplay because it was about all I could take. Animation/VOS - Not much that I could see in the short time I played. IHOS - Clear and bright but items much too small. Two types - list and identify by shape. Character pop-ups were annoying during the IHOS to introduce a puzzle/mini-game. Hint - Moderate recharge. Random Click Penalty - Cursor turns blue and makes knocking sound. I wanted to like this game because of the vampire story but just couldn't get into it. Rated 2 out of 5 by Pearly11 from Flatter than flat What have they done? Such a great story, well researched and then they goof it up with paper dolls that woosh in and cartoon bats. I've never seen anything so uninspired in all my life and hope I never do again. Looks like the developers of this game had a great idea but couldn't execute it due to lack of funds. They'd better waited, because this game could have been a great one. 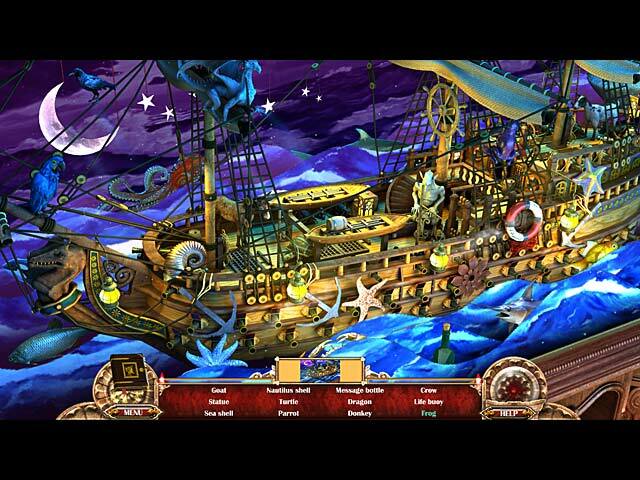 Rated 2 out of 5 by n000873 from This game is not worthy of Big Fish The graphics were terrible. The puzzles very varied but nothing could really get me past the cheesy lady that came up on the screen. Rated 2 out of 5 by Zooey2 from Childishly Simplistic The graphics are okay, but the short demo (less than 30 min.) is all HOS with very simplistic mini games. It gets boring really quickly. Rated 2 out of 5 by butterflydee89 from Only for Beginners This game is not worth the effort of downloading for a true HO player. Rated 2 out of 5 by tailswhiskers from Could not finish the demo When I installed this game, I thought it would be fun to play. I was wrong. 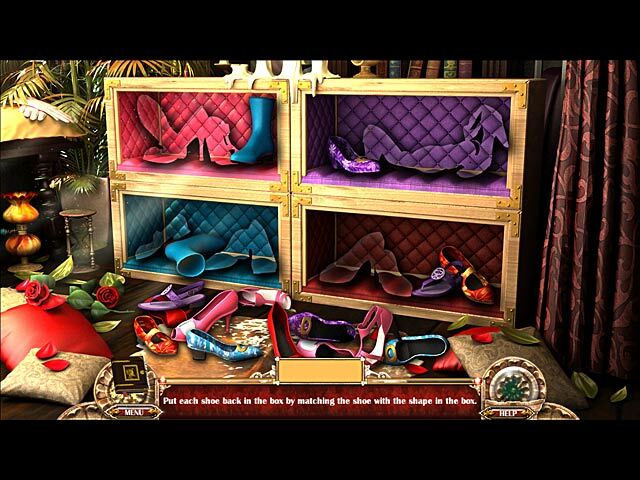 The hidden objects were very hard to find, the game was hard to get through. I still have time to play, but I am going to uninstall the game. 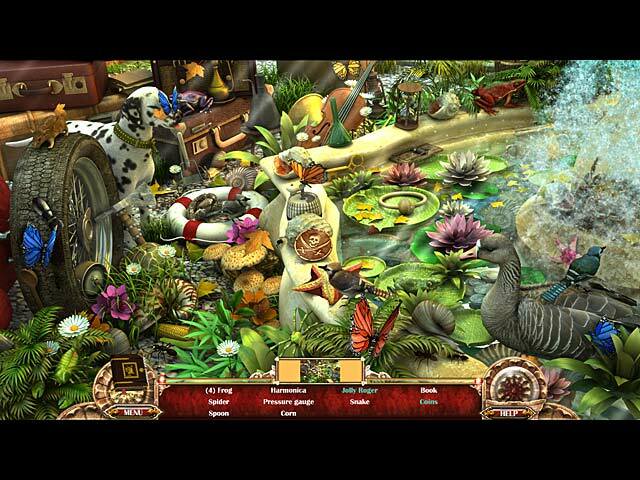 The hidden object are to games in one. I do not recommend this game. If the game can be redone, it might be better. Then I would try it again. Rated 2 out of 5 by Calicohorse from With the Majority While I didn't find it awful, I agree the mechanics are clunky; I never did figure out how to use the zoom feature and everything seemed to lag a bit. The artwork is a real mishmash, starting off beautifully (as someone else wrote# and then looking like pixelated cutouts #if that makes sense#. I did like how the HO were hidden in most scenes #tricky) but there were a few junk piles too. The puzzles were just "meh" and I did miss an adventure gameplay. Rated 2 out of 5 by lacydutch from It could have potential The storyline was just weird. Once in the HOS, I didn't understand why I was going in other areas at first but once in a new area, I was unable to go back to the area I had already started. Also, in the silhouette portion, I used a hint and it took an item that I didn't even see, that's because there were more objects to look but you couldn't see until you found the first objects showing in HOS, then it provided additional items to find. Rated 2 out of 5 by pennmom36 from IS THIS A JOKE? This would have been a perfect April fools game. The profile page looked awesome, it was interactive, spooky, clear graphics and you got to choose from 4 modes of difficulity and you got to adjust the graphics all the way up to super fast computers. But for what? As soon as the cut scene started it looked like I tried my hand at game developing! Someone drew a bunch of horrible pictures and flipped through them to make it move. Then in the first scene a stick figure woman with a squeaky high voice says she can't wait to get to work! I made it to the second scene and quit. Rated 2 out of 5 by jlcteacher from Not Worth Buying The transitions in this game are very slow. The HOS are very dark and the mini-games pop up in the middle of the HOS and interrupt you. I didn't like the artwork either. I played through the demo thinking maybe it was just a slow start, but sadly that was not the case. Rated 2 out of 5 by JustTheFacts from Okay, This Is ... Different BASED ON COMPLETED DEMO Actually the graphics quality is perfectly fine, I have reviewed two big name games (one a new release) just this week with worse graphics, and this game gives you options for adjusting graphics to suit yourself. I managed to get a mix I could live with. The problem is the style is seriously dated photo realism. Also, the artists can’t draw faces to save their lives. Having said that, this is an extremely odd little game in other ways. And once again, not a HOPA but a HO game. Let’s walk it through. I really liked the opening cutscenes, which told the story of Vlad Tepes, the real life historical figure some allege to have been a vampire. Concept art-style sketching is done for this and I think it looks great. The story is set 500 years later, when presumably Vlad comes back looking for his long dead wife. The main menu offers three slider options to adjust the graphics: quality, brightness and sharpness. I found lowering the sharpness eased the brittle quality a bit. As I said, photo realism. In bright, light, pleasant rooms. Not exactly candy for the eyes, but not sand paper either. Now the game play, which is what kept me going to the end of the demo. Trying to work it out. “We” appear to be a young peasant girl (with an appalling voiceover) getting ready for work at the castle. The room we find ourselves in is the HOs. We have a list of named items, followed immediately by a list of silhouettes, all for the same scene. As well, items in blue trigger mini-games within the scene. I played a ‘hit the hammer at the right moment’ one, identify shoes by shape, restock the shelves with books, and a HOs within the first. And one of those great mirror pieces ones where the image changes when you move the piece. They did a very good job at that. We have some extra resources in this one. We can zoom in, pan around, and see a mini-map to show us where we are in the scene. The HOs are tricky, because they are very well hidden, nothing to do with the graphics. The puzzles are easy. As soon as this scene is complete, we are magically transported to the next, where the same procedure is followed. There is a hint that the gameplay may increase in complexity and difficulty as we play. The screenshots flashed at the end of the demo (which took me 35 mins for two completed locations) suggest the colour and brightness continue throughout the game. Giving this game two stars is generous, I certainly can’t recommend it, but I hope the developers will keep trying. They have made something different here, and in a world swamped with cookie cutter HOPAs, that’s worth something. Rated 1 out of 5 by foreignangel from frustratingly annoying I wanted to give this game a chance despite the bad reviews. Let's just say, the bad reviews were earned honestly. I didn't even make it past the second scene I was so annoyed. The annoyance began with the tutorial randomly popping unrelated to anything I was doing and pausing the scene. And you couldn't skip it. Each scene is an HO that randomly gets interrupted by mini games when you find certain items. The first is an axe chopping wood and for the life of me, I couldn't figure out why some clicks worked and others didn't. It didn't seem to matter whether I was in the red, green, or blue zone. The second mini game was to organize shoes into a colored box. Maybe it's just OCD of me, but you expect to organize shoes into pairs and according to color, but there was nothing organized about how these shoes were organized. That was where I gave up. Didn't think a game was worth that much frustration. Also, some of the HO items are so well covered or blended in that you simply can't see them. I haven't clicked the hint button that many times in 20 minutes ever! Rated 1 out of 5 by ChazWax from Glacial Pace Horrible game. Doesn't go anywhere. Cluttered rooms that you search forever in variations of the same thing before anything happens at all. Rated 1 out of 5 by Deb_S from Dont Do it!! tiny objects, terrible graphics, a cursor that zooms, and pans.. but not at the same time.. so you have to pann... zoom... un zoom.. re pan, re zoom... pictures look as if Jr High students made them.. and corny voice overs! Oh and the birds... when you find some objects... the screen freezes... then there are birds... then a whole new mini game... and then your stream of thought is broken from the original search.....when you are finally returned there! Rated 1 out of 5 by pendle_witch from What a nightmare!!! This game was a complete nightmare. I only managed to put up with the first scene before I gave up on the jumpy gameplay with awful artwork. Wouldn't have it if it was free. Rated 1 out of 5 by jil1 from Terrible! I didn´t like the artwork, the artist should learn to draw first, the movement is so slow. I really didn´t like it. The pro is that the mini games are interesting (although the scenes are very ugly). The game should be very nice if it works well, but it didn´t. The idea of the story is good but the final result of the game is so boring. I played the demo and will not spend money buying it. I think it is not worth. One of the worst HOG I have played till now. I don´t recommend this game. Rated 1 out of 5 by GamerGirl2010 from Don't waste your time. I had to force myself to finish the demo. It's painful. It's hard to look at, the graphics are so bad. At least go more artistic/cartoon if you're going to be that cheap. I registered to comment just to explain how terrible and disappointing this game is. It's so slow- I have no idea where vampires or love or anything come in. Terrible. Horrible. Boring. Ugly. Rated 1 out of 5 by MightyMom3 from poor graphics Graphics were very amature and small. Did not enjoy playing this game. Would not reccomend it. Rated 1 out of 5 by avvy from HORRIBLE I have played many, many hidden object games and this is by far the worst. I too left within 10 minutes. Rated 1 out of 5 by M_E_M_O_M from Couldn't Finish the Demo.... I hated this game. Very dated, and not at all enjoyable for me. I'll keep my money for a game I like, thank you very much! Rated 1 out of 5 by jorn1996 from IS that the best you've got? If you played it more than 10 minutes, you beat me. Just plain awful! Rated 1 out of 5 by Babett10 from Failed The game was a waste. I wouldn't even play it if it was free. The graphics were really bad and I didn't see any challenge to it. Bad game. 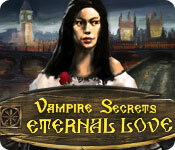 Rated 1 out of 5 by sbiffis from Vampire secrets:Eternal love Terrible!! Not worth the time it took to download. Rated 1 out of 5 by Collydoll from Dont bother Ive been playing HO games for a long time and this would be the worst. You have to zoom in on the screens which I found cumbersome. No voice over and just not a game I would buy. On the up side, possibly good for beginner beginners.